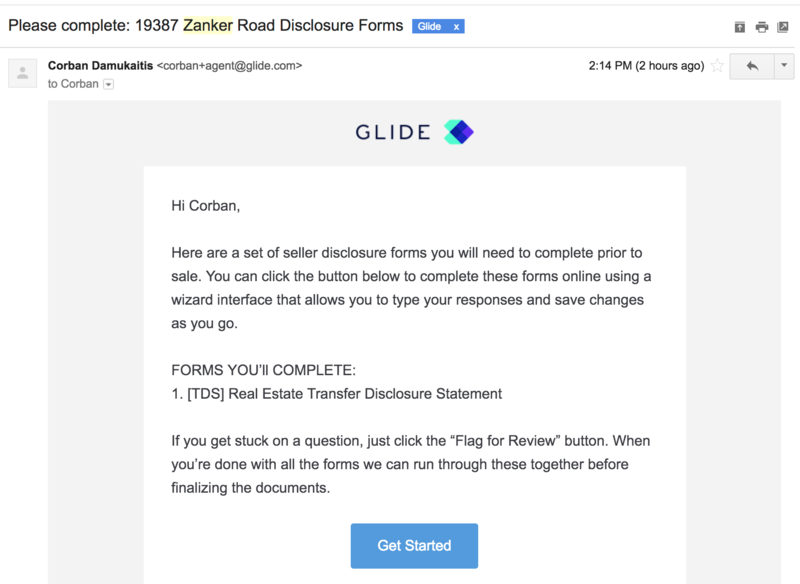 Glide allows you clients to complete critical disclosure documents electronically via a user-friendly, TurboTax-style wizard. 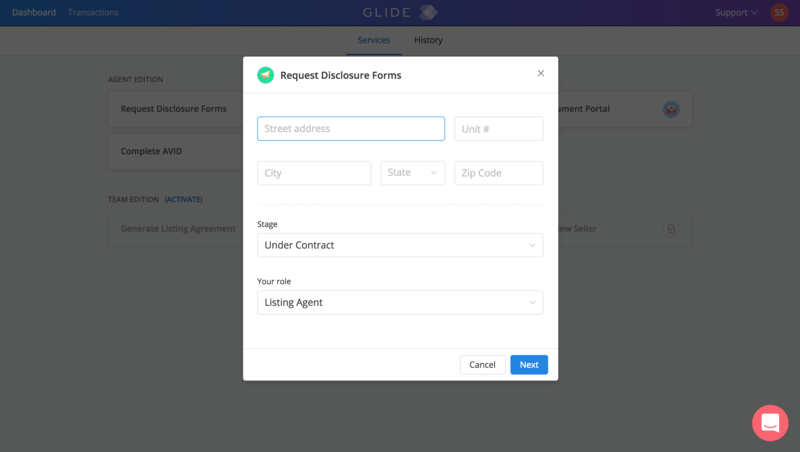 To initiate the process, you can use Glide to select forms, confirm recipient information and prepare a personalized invitation to your clients. Begin by navigating to your glide home screen. When requesting disclosure forms, you have the option of associating those forms with an existing Glide transaction, or creating a new one. When creating a new transaction, you'll have the option to specify whether the transaction is pre or post contract, as well as your role. Only the listing agent will be prompted to review the answers submitted by the client after they have finished completing the forms you select. 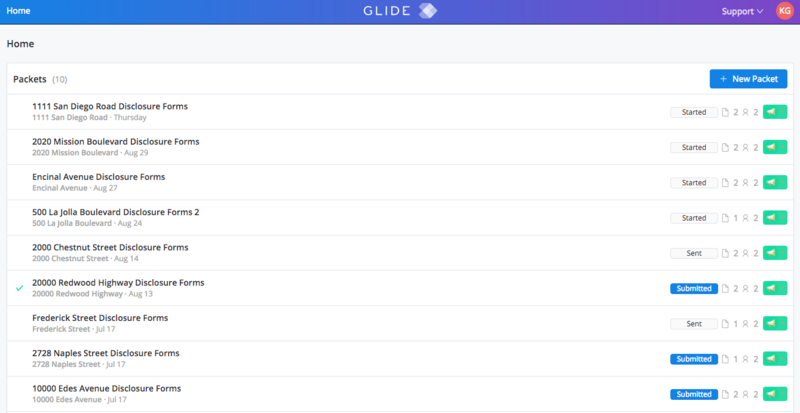 Glide supports a variety of official association forms, with new ones being added every day. Note: depending on the address you specified for your transaction, some local association forms may not display. 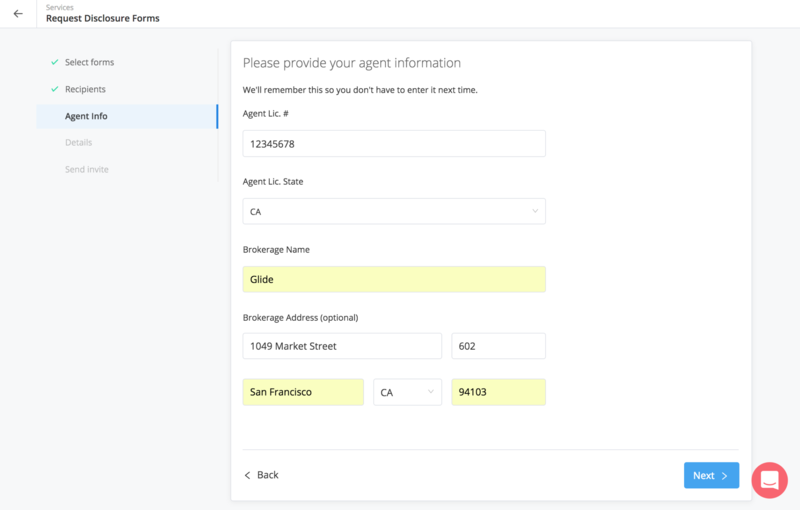 Add forms by clicking on the empty box that reads "Select form..."
Glide offers flexible options for collaborating on forms with multiple clients and colleagues. Each party included on the recipient screen will be designated with a role of "Packet Admin" or "Fills Forms." 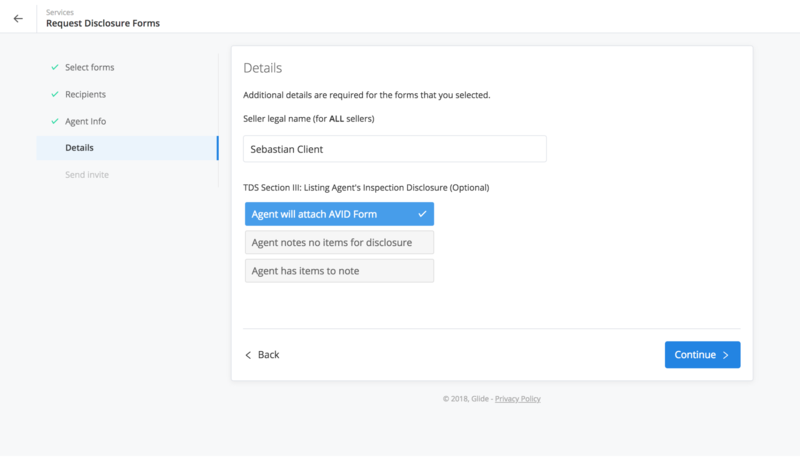 Packet Admin - The packet admin will receive email notifications of client activity and can login to Glide in order to resend client invitations, view client responses, cancel invitations and view completed documents. 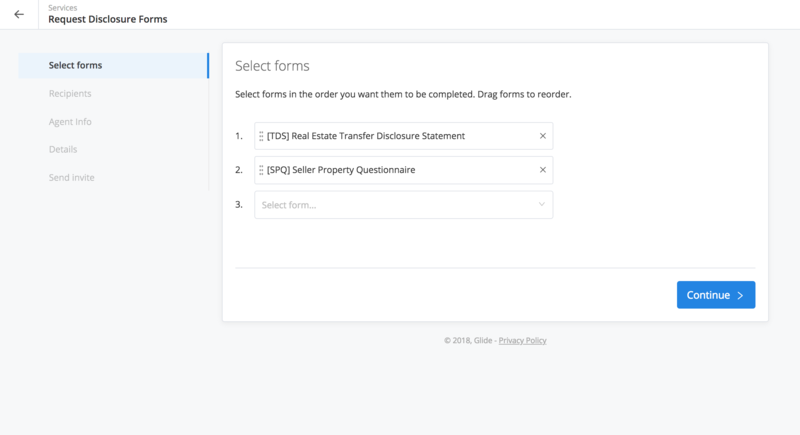 Fills form - Buyers and sellers can fill the form. 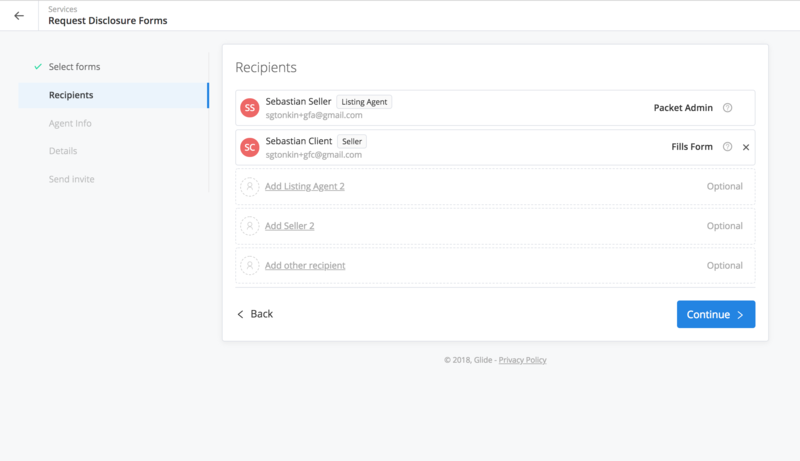 If you invite multiple buyers or sellers, each will be able to login independently, but they will share a single set of answers. If we detect that both clients are editing the same form packet at the same time, a warning will be displayed to them. In order to send out forms, you must include at a minimum one agent and one client. The first time you send out a form packet for a transaction, you'll be prompted to provide a license number, license state, brokerage name and brokerage address for the primary agent on the transaction. 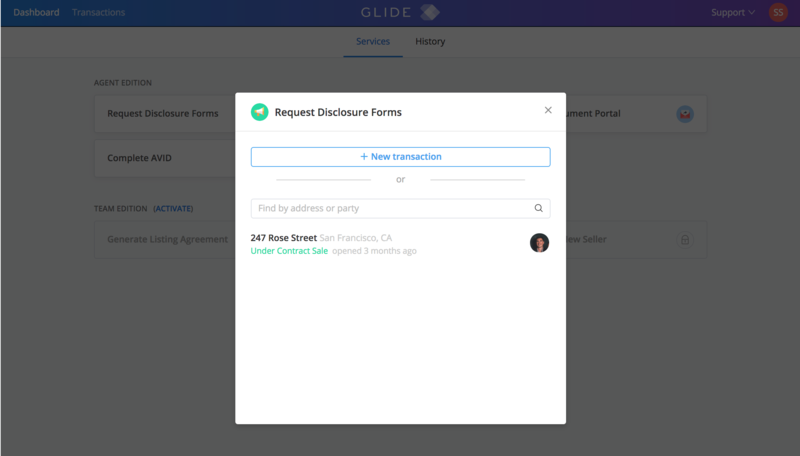 Depending on which forms you select, Glide will prompt you to enter additional transaction information that appears on those forms (for example the APN or year built). These fields will be added to your completed documents alongside the responses provided by your client. Before sending your invitation you will have one last opportunity to confirm the details you've entered. 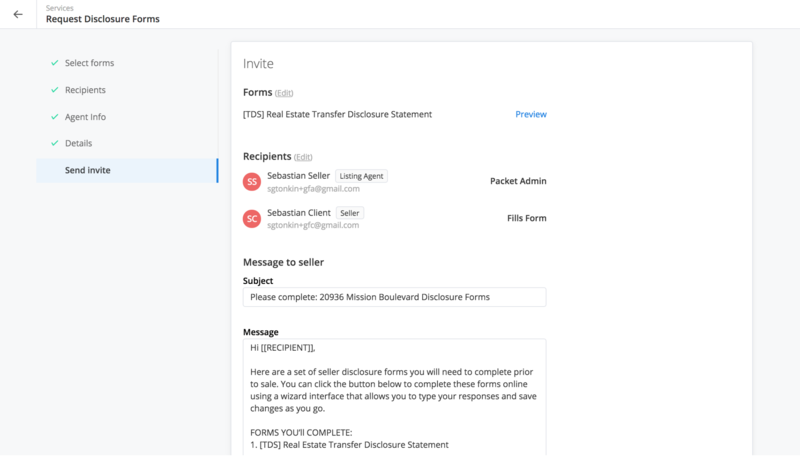 You can also use this screen to compose a custom invitation message to send to your client or "preview" the experience you client will have filling out a specific form. The "preview" mode will not save any answers you enter there. You can use the "[[RECIPIENT]]" variable to automatically specify the first name of your client. Once you hit the "Finish" button on the "Send invite", an email invitation will go to your client that includes your custom message and a large "Get Started" button they can use to begin the process of completing their forms. You can resend the invitation anytime from the "Packet detail" screen, located in the history section of your dashboard or the items section of your transaction.